Growers Supply, the industry-leading manufacturer and distributor of gardening, growing and nursery supplies, announced that the company now carries Ed Rosenthal’s Zero Tolerance® products. The all natural line of pesticide and fungicide provides growers with a safe way to solve a number of issues that plague gardens everywhere. Zero Tolerance products were developed by famed cannabis advocate, writer and cultivator, Ed Rosenthal. Rosenthal has served as the “guru of ganja” for the past 40 years, and during this time has written a number of books that have collectively sold over one million copies worldwide. Rosenthal is a leading marijuana advocate and currently is the executive director of Green Aid: The Medical Marijuana Legal Defense and Education Fund. Growers can now utilize Rosenthal’s expertise by administering Zero Tolerance Pesticide or Zero Tolerance Fungicide, both of which can be found at Growers Supply, throughout their garden. Both of these products are safe for the grower and the environment. They meet EPA guidelines and are 100% vegan. When used, both products evaporate within five days and leave no residue. While Zero Tolerance products were designed for heartier plants with a waxy surface, they can be diluted and safely used on delicate plants. Zero Tolerance Pesticide is the perfect way to kill and repel aphids, spider mites, thrips, caterpillars, mealy bugs and mold. The product is safe to use within one week of harvest. 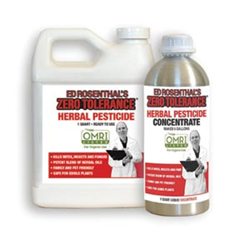 Zero Tolerance Pesticide can be purchased in a quart or gallon, and there is also a 1 pint concentrate and a quart concentrate. The pint makes 2.4 gallons, while the quart makes 5 gallons. Zero Tolerance Fungicide allows growers to easily address problems with powdery mildew, gray and white mold and black spot, as well as other molds and fungi. It eliminates spores quickly and prevents the growth of future spores. It is available in 1 quart and 1 gallon sizes.